Please notice that the Lord is our Judge—he has all judicial power; the Lord is our Lawgiver—all legislative power; and, the Lord is our King—all executive power. Perhaps this verse is where James Madison and the Founding Fathers got the idea for Three Branches of Government! Our forefathers struggled to be free from dictatorial, absolute human monarchy. We do not have a human king. When asked who would be our king, Thomas Paine exclaimed in his booklet, Common Sense, “But where, says some, is the King of America? I’ll tell you. Friend, he reigns above, and doth not make havoc of mankind like the Royal Brute of Britain.” For over 200 years Americans have been thankful for our Three Branches of Government! JESUS CHRIST HAS ALL AUTHORITY! Jesus Christ therefore has all authority in heaven and on earth—Judicial, Legislative and Executive! On the day of Pentecost, following the resurrection of our Lord Jesus Christ, the church which he promised to build was established in the city of Jerusalem (Matthew 16:13-19; Acts 2:46-47). Three thousand people heard the good news, believed the report, repented of their sins, were baptized (immersed) for the forgiveness of their sins, and added to the church (Acts 2:36-41, 47). As we follow the fortunes of the church as it spreads from Jerusalem, Judea and to the uttermost parts of the world of that time, we find out how the church was organized politically. From prison Paul addressed the church in Philippi, “together with the overseers and deacons” (Philippians 1:1). 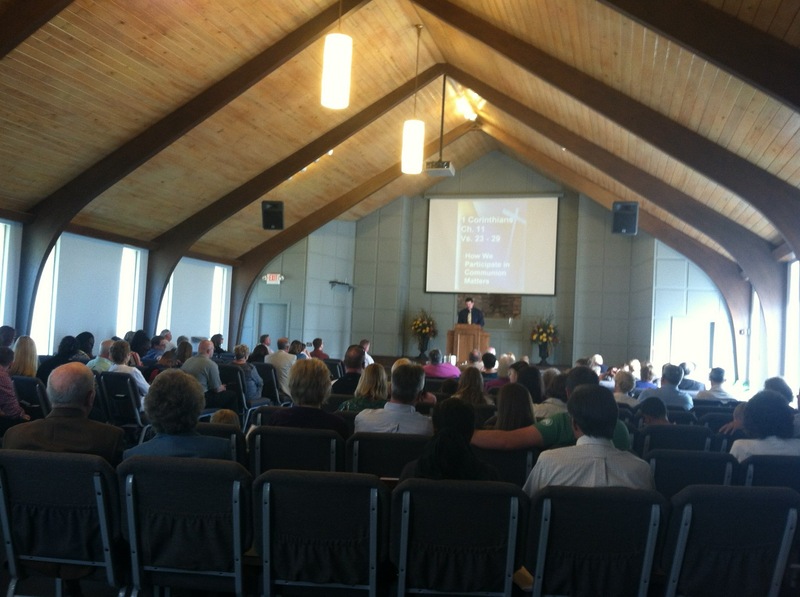 There is no authority for the “one man pastor system” found in almost all denominational churches. Neither is there any foundation for the hierarchy of the Roman church, with the Pope as the head of the church. The Pope is and has been a usurper from the beginning of the falling away to the present day. (Read Pontifex Maximus: A Short History of the Popes by Christopher Lascelles). 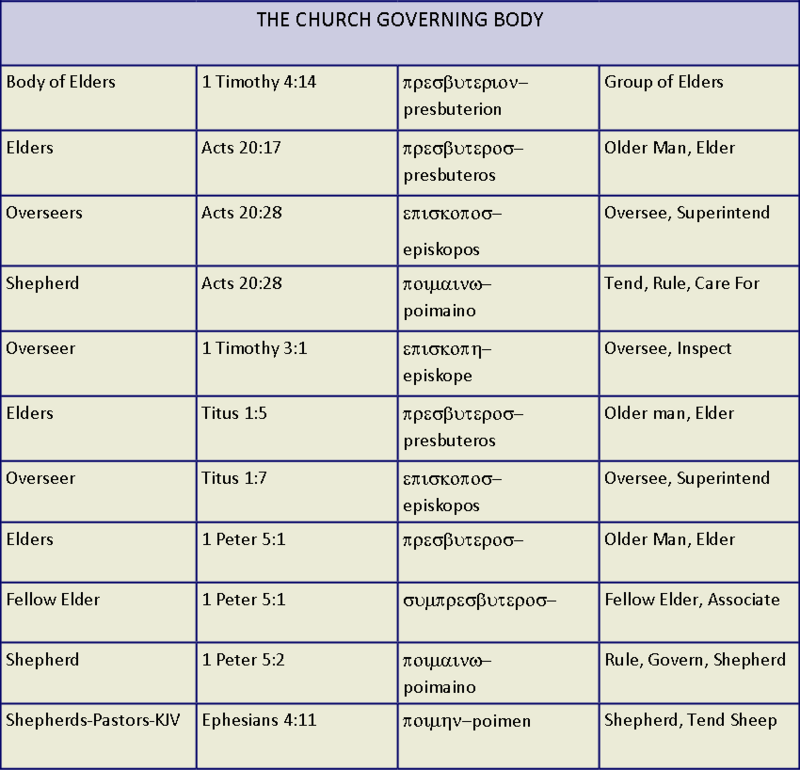 Each congregation of the church universal is to be governed by a “council of elders-ESV,” “body of elders”-NIV, “eldership”-NKJV or “group of elders.” Paul charges Timothy not to neglect the gift given to him by this body of elders: “Do not neglect your gift, which was given you through prophecy when the body of elders (Greek, presbuterion) laid their hands on you” (1 Timothy 4:14). All of these terms are based on the standard translation of the scriptures. Notice that in the context of Paul’s speech to the Ephesians elders, three synonyms are used to describe the same group of men. They are elders, shepherds, and overseers (Acts 20:17, 28). 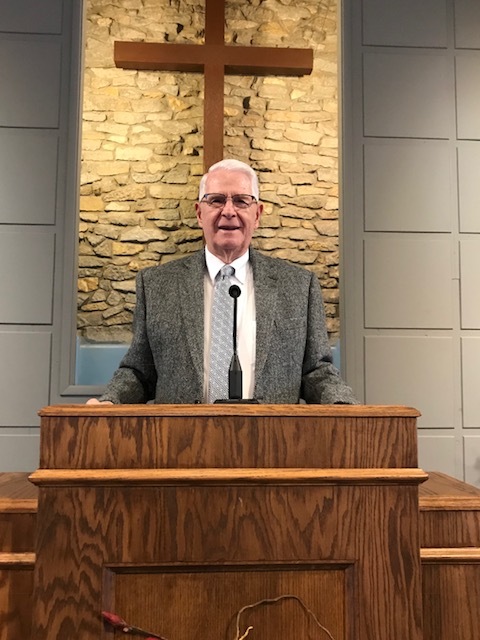 Observe also in the context of the qualifications of men being considered to carry out the function of governing the congregation, the synonyms overseers and elders are used as convertible terms (1 Timothy 3:1; Titus 1:5, 7). Finally, in the first epistle of Peter, he describes himself, not as the first Pope, but as a “fellow elder.” And then he describes the class of men of whom he was a “fellow” as being elders, shepherds and overseers. Would not a lot of confusion in the religious world be done away, if only men would go back and restore the simple New Testament plan of church government, with Christ as the head of the church and a plurality of men over each congregation, with full autonomy for the care of each congregation of the Lord’s people?